Ruby is among the rarest of all the major precious stones, with only a handful of sources producing facet qualities in any commercial quantity. An approximate ranking of important ruby origins is given below. This applies only for the finest untreated qualities from each source and is but a general approximation. In other words, a top-quality Thai/Cambodian ruby can be worth far more than a poor Burma stone. Burma: While Mogok is the traditional source of the world's finest rubies, good stones are rare even from this fabled area. Pigeon's blood was the term used to describe the finest Mogok stones (see page 331), but has little meaning today, as so few people have seen this bird's blood. 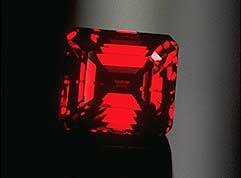 Mogok-type rubies possess not just red body color, but, by a freak of nature, red fluorescence, too. In addition, the best stones contain tiny amounts of light-scattering rutile silk. It is this combination of features which gives these rubies their incomparable crimson glow. In Mogok rubies, the color often occurs in rich patches and swirls, and color zoning can be a problem. Star stones are common. The shape of Mogok ruby rough generally yields well-proportioned stones.In 1992, the Mong Hsu mine began producing good material, but most cut stones are under 2 ct. With the exception of the material from the Thai/Cambodian border, virtually any of the sources below can produce material of similar color. The problem is that material clean enough to facet is rare. Vietnam: In the late 1980s, this material literally exploded on the world gem market. Although Vietnam's ruby originates from two different mines (Luc Yen and Quy Chau), both sources display similar characteristics. The best Vietnamese ruby is equal to anything ever produced in Mogok, and if it had some history behind it, would probably fetch similar prices. Sri Lanka: The classic case of giving a dog a bad name. Some of the world's finest rubies have come from Sri Lanka's gem gravels, but, because of the erroneous 'pink sapphire' moniker (see page 402), they have been largely overlooked. Top-grade Sri Lankan reds are virtually indistinguishable from their Mogok brethren, but many stones tend towards purple or pink. As with Sri Lanka sapphires, color accumulates in large stones and so they can be quite magnificent in sizes of five ct or more. Due to the bipyramidal shape of the rough, many stones are cut with overly deep pavilions. This material is strongly fluorescent and stars are common. Kenya, Tanzania: Stones from these sources are magnificent when clean, but facet-grade material is relatively rare. Like Burma, much of this material is strongly fluorescent. Afghanistan: Jagdalek has produced rubies which rank with the best of Mogok, but facetable material is in short supply. Similar to Vietnamese rubies, many of these stones contain small areas of blue color. Strongly fluorescent. Thailand/Cambodia: This material's main attribute is its high clarity, but the flat crystal shapes generally yield overly shallow stones. 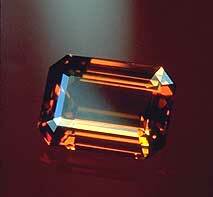 Due to the high iron content, which quenches fluorescence, most stones tend to have a garnet-red color. An additional problem is the total lack of light-scattering silk inclusions (star stones are not found). Although heat treatment does make improvements, it is not enough. In Thai rubies, only those facets where light is totally internally reflected will be a rich red; the others appear blackish, as with red garnets. Thai stones are actually less purple than most Burmese rubies. However, Mogok-type rubies appear red all over the stone. Not only is a rich red seen in the areas where total internal reflection occurs, but, due to the red fluorescence and light-scattering silk, other facets are also red. This glowing red color is what makes Mogok-type rubies so special. With the decline in Burma production during the 1962–1990 period, the market became conditioned to Thai/Cambodian rubies, with some people actually tending to prefer them (In the land of the blind, the one-eyed man is king). Thai/Cambodian rubies are acceptable only when good material from the above sources is not available (see box, page 434). India: The classic Karnataka (Mysore) Indian locales produce mainly opaque, low-grade star rubies; recently better material has been reported from Orissa, but as of 1994, India remains a fringe source. Unlike rubies, for which perfection is unknown, even at the 5-ct level, large fine sapphires of 100 ct or more do exist. An approximate ranking of blue sapphires in terms of origin is given below. As with the ruby origin rankings, this applies only for the finest untreated qualities from each source and is but a crude measure. In other words, a top-quality Australian sapphire can easily be worth more than a poor Kashmir stone. Kashmir (India): In the world of blue sapphire, Kashmir is the peak, the quality against which all others are measured. Kashmir sapphires are noted for their rich blue hue and distinctive "velvety" luster, caused by the presence of minute exsolved inclusions. The Kashmir mine, however, produced in quantity only during the years 1881–1890, and has produced little since. For this reason, Kashmir sapphires are generally available only through the estate/auction market. Star stones have been reported, but are rare. Much Kashmir material is strongly color zoned and the bipyramidal habit results in overly deep stones. Thus it can bear a strong resemblance to that from Sri Lanka. Many old Kashmir stones were cut as sugarloaf cabochons. Burma: Next to Kashmir, Mogok sapphires are unsurpassed. Although certain Sri Lankan sapphires may rival them in beauty, the Burmese stones are of a deeper, richer color, there being simply more color inside those from Mogok. Moreover, the Mogok stones do not require heat treatment for their beauty, but come out of the ground in living color, a blaze of smoldering, imperial blue. Many fine star sapphires have been found in the Mogok area, some of large size. Crystal habit in Mogok sapphires tends to be more tabular than either Sri Lanka or Kashmir. Thus faceted stones are not so bottom heavy. Sri Lanka: For those who prefer slightly lighter, livelier colors, Sri Lanka is the locality of choice. Blue sapphires from Sri Lanka have a unique beauty all their own, the best being a sharp, electric blue. Rakwana stones are of particular note, with their color compared to that found on the tip of a peacock's feather, or that on a peacock's neck, but fine stones are found in many places. Until the spread of heat treatments in the late 1970s, Sri Lankan sapphires commonly reached the richer blues only in stones of ten carats or more. Today deep blues of all sizes are common. Sri Lanka is the world's most prolific producer of giant sapphires (>100 ct). 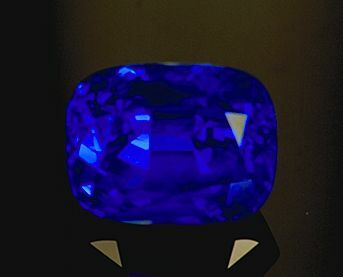 While Mogok stones tend towards a more intense, royal blue, the Sri Lankan sapphire is typically a brighter, cornflower blue, due to less color in the stone. Sri Lanka also produces fine star sapphires, some weighing hundreds of carats, and is the greatest producer of star corundums of all colors. As with all Sri Lankan gems, cutting can be a problem. The typical bipyramidal habit and over-emphasis on weight retention often result in bottom-heavy stones. Australia: Australia is one of the biggest producers of faceted sapphire, but most are dark and inky in color and require heat treatment. The mines of New South Wales produce the better stones, while the Queensland production consists mostly of darker blues. Australian sapphires suffer from bad press. While good quality stones, which can compete with the better Thai and Cambodian material, are occasionally found, they are inevitably sold as anything but Australian. Cambodia (Pailin): The Pailin mine in Cambodia has produced a number of fine stones over the past 100 years, although today production is limited, due to political problems. Pailin stones, however, tend to be on the dark side and faceted stones larger than five carats are rare. This is in contrast to Kashmir and Mogok, which have produced a number of sapphire giants. The material is good for cutting stones below two carats, but even the best Cambodian material cannot compete with the best from Kashmir, Mogok, or Sri Lanka. This source has a particular "romance" aspect to it that is not supported by actual quality. China: Material comes from a variety of different locales, but all is iron-rich and tends to be overly dark. Nigeria: Nigerian material is also iron-rich and tends to be overly dark. Thailand: In Thailand, the occasional fine stone is produced, particularly from the mines of Bo Ploi, in Kanchanaburi Province. Bo Ploi stones may be of fine color and sometimes reach sizes of 50 ct or more, but most are marred by a certain cloudiness. Many Bo Ploi stones are sold as Sri Lankan, due to their strong color zoning. Sapphires from Chanthaburi and Phrae tend to be overly dark, although some are nice. USA (Montana): Yogo Gulch in Montana produces sapphires of fine color when found in sizes of greater than one carat, but such stones are extremely rare. The lack of larger stones (one carat or more) and the flat crystal habit (which results in low cutting yields), has kept Yogo from being a source of major importance. Material displays extremely uniform coloration. Most is cut as round brilliants. Other Montana localities produce mainly fancy colors, although heat treatment has changed this somewhat. Compared to Kashmir, Burma and Sri Lanka, all other sapphires sources are of relatively minor importance for high-end stones. The term fancy sapphire is used to describe corundums other than red or blue. Sri Lanka is king of the hill. 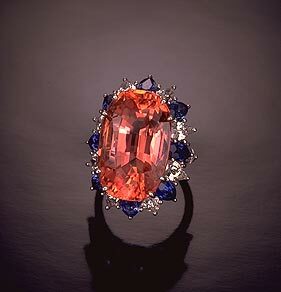 Within this small island are found sapphires of virtually every color, including some for which the island is the definitive source, such as the lovely pink-orange padparadscha. Tanzania's Umba Valley is also noted for fancy sapphires, as are Montana's mines (non-Yogo). 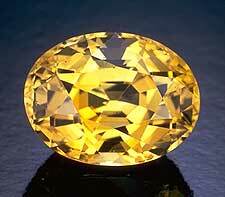 Yellow sapphires from Sri Lanka are generally of a light to medium hue, without any brownish overtones. Deeper hues are, like the Sri Lankan blues, reached only in larger sizes, or via heat treatment. Heat treatment produces deeper yellows, golds and oranges that are virtually unknown, or rare in nature. The very rare pinkish orange padparadscha sapphire is found mainly in Sri Lanka and at Vietnam's Quy Chau mines. While similar gems are sometimes found at Tanzania's Umba mines, most from this locality tend towards the brownish orange. Padparadschas from Sri Lanka sometimes fetch prices that rival even ruby. It is a common, but erroneous, belief among many traders and gemologists that Thai/Cambodian rubies are more "purple" than those from Mogok. Using the proper definition of the term purple (i.e., a hue or hues lying between red and violet), we actually find that Mogok rubies are more purple than those from the Thai/Cambodian border. Gem dealers know what they are seeing, but do not describe it in terms consistent with the use of those same words in other industries. To the color scientist, purple is merely a hue position. In order to properly describe the color, saturation and darkness must also be defined. The problem with most dealer descriptions of gem colors is that they try to describe all colors and color differences in terms of changes in hue position and darkness. In fact, when judging the color of gems, saturation of hue is of paramount importance, not tiny nuances in hue position. When a gem dealer says that a Thai/Cambodian ruby is too purple compared to those from Mogok, he is confusing the low-saturation red (grayish red) of the Thai ruby with the higher saturation (but more purplish) red of the Mogok ruby. Figure 10.9 Which of the above colors is more purple? The answer is neither. Both colors have identical hue positions. However there are differences in darkness and saturation. The color at left has a darkness of 50% and saturation of 100%, while the darkness and saturation values of the color at right are 68% and 63% respectively. Thailand and Australia both produce fine yellow sapphires, with the stones from Chanthaburi in Thailand grading into the highly desirable Mekong Whisky golden yellow to orange colors. These bring high prices locally in Thailand and are quite beautiful. Australian yellow sapphires tend to be overly greenish, although fine golden yellows are found in the Queensland mines. Sri Lanka, Thailand and Australia are the only sources which produce deep yellow sapphires in any quantity, although the Mogok area produces the occasional stone. The finest green sapphires come from Sri Lanka, but are extremely rare. These stones tend to be of a lighter and more lively green than those from Thailand and Australia. The latter two countries do produce good green sapphires, but most tend towards an impure blue-green or yellow-green which is not very attractive. Green sapphires of good color and clarity over 10 ct in size are relatively scarce, but demand is slow. Violet and purple sapphires are found mostly in places which produce both ruby and blue sapphire. The finest stones come from Mogok, Sri Lanka and Vietnam. Purple stones bordering on ruby color are most valuable and may reach prices approaching those of ruby. Star stones are possible, but relatively rare. Among the most unusual sapphires are those which display a change of color. These are judged by the quality of color change, the best going from the green side of blue in daylight to a reddish purple in incandescent light. A number of sources produce such stones, but fine examples are rare. The best are colored by vanadium (just like the Verneuil synthetic corundums) and come from Mogok and Umba, Tanzania. These are extremely rare. More common are Sri Lankan gems which contain a mixture of chromium (red) and iron-titanium (blue). Such stones appear bluish violet in daylight and purple under incandescent light. In the author's opinion, these are marginal as color-change sapphires. Most tanzanite shows a similar color shift. Fine star rubies come mainly from Mogok and Sri Lanka. While Mogok has the reputation for producing the best pieces, the world's finest large example, the Rosser Reeves Star Ruby, was mined in Sri Lanka. As for the finest star sapphires, they also come from Mogok and Sri Lanka, particularly the latter. Deeper colors in Sri Lankan stones are mainly (but not always) found in the larger sizes, where the color builds due to the longer light paths. The best stones will have just enough silk to create the star effect, but not so much as to harm the transparency and color (see Figure 10.12). Such stones are extremely rare and valuable. As for black star sapphires, the most valuable are the golden-star black stars from Chanthaburi, Thailand. Color: This is paramount. One can have an expensive stone with a poor star, but valuable stars of poor color do not exist. Top-dollar colored gems have top-dollar color – it's that simple. Transparency: If the proper amount of colorant exists in the stone, only good transparency will bring it out. The so-called 'glass body' is the ideal. Too much silk means short light paths, which translates into poor, grayish color. Star: The star should be complete and sharp, with no missing or broken legs, and each ray should extend to the girdle. Clarity: Silk should not be concentrated so thick as to harm transparency. Stones containing too much silk will have rather poor color, as silk diffuses the light. Longer needles generally produce a better star than the tiny particles which are sometimes found, but as with all grading, it's the end product that counts, not the conditions which produce it. Like all gems, the ideal is totally fracture-free. Cut: Only proper cutting releases a gem's beauty. 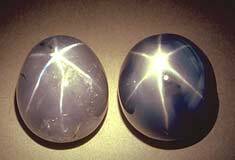 Cabochons need to be cut with medium to high domes (overly flat domes allow the star to be seen only from directly above). The base should be smooth (polished or unpolished), flat (or gently rounded) and the star should be properly centered when the gem rests on its base. Domes should be symmetrical, with no flat spots (which distort the star). Like middle-aged humans, a common problem is excess weight below the girdle. Ideally, less than 10% of the gem's depth should lie below the girdle, but this is rarely found. Due to the bipyramidal shape of many Sri Lankan crystals, local lapidaries often cut them with 50%, or even 80%, of the total depth below the girdle. This is unacceptable, for such stones are extremely difficult to mount in jewelry, and have the face-up size of pieces of much smaller weight. Low-quality stars contain an over-abundance of silk (left photo). While this makes for a sharp star, transparency, and thus color, suffers. Good transparency allows longer light paths, and thus, richer color (right photo). The result is a far more valuable stone. Ordinary cabochons are evaluated in an identical manner to star stones, except they have no star. While it is a general truth that they are cheaper than faceted goods (because of their typically poorer clarity), cabochons have a special beauty all their own. What they lack in scintillation, they make up in color. In fact, the highest total price ever paid for a single ruby was $5,860,000 for a 38.12-ct Mogok ruby cabochon (Anonymous, 1994). Color: Overall, a priority. The best rubies look like someone painted a swath of fluorescent red across their face. 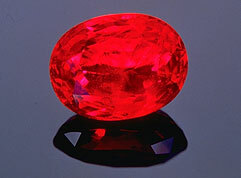 It is a glowing red, diffused throughout the stone, and derives from the unique property of fine rubies, a rich red fluorescence to daylight. 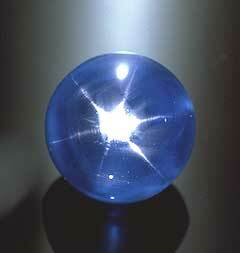 For blue sapphire, the color should be a rich blue, verging on the violet, not too light or dark. Clarity: Generally eye clean, but with the following caveat: it should have a velvet-like softness, as opposed to diamond-like transparency. Cut: It should show the raw material off to best advantage, without presenting mounting or durability problems. Look for simplicity of design and execution. As the one element of the gem influenced by humans, it should bear the visual signature of its maker. Like a Miles Davis horn line, the cut should be an exquisite balance of economy and intensity. Overall: The best walk the walk and talk the talk. They wink at you from across the room, call your name, beckon you closer. When you see them, you are driven to possess them and will sell your soul, to Devils or Lords, to call them your own.